Any Organization that needs to track all types of employee time off, such as vacation, sickness, jury service etc. $1.50 per employee per month. Price breaks above 50 employees. 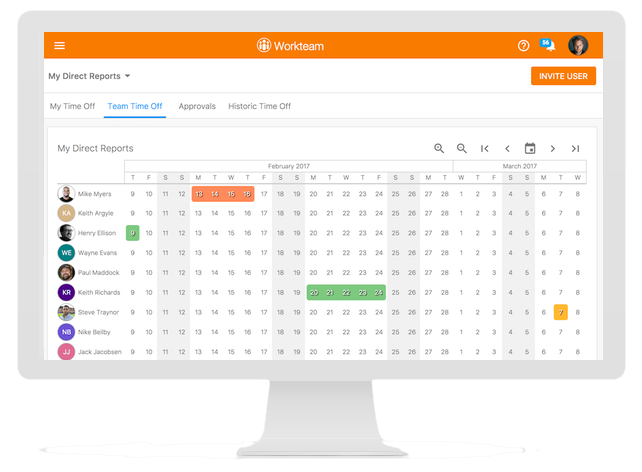 *FREE* Workteam Time & Attendance provides everything your organization needs to manage employee time off and hours worked by both your regular and non-regular hours staff. 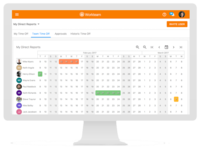 Alongside configurable time off policies, it provides workflows for requesting and approving time off and team members can also see when their colleagues have time off. 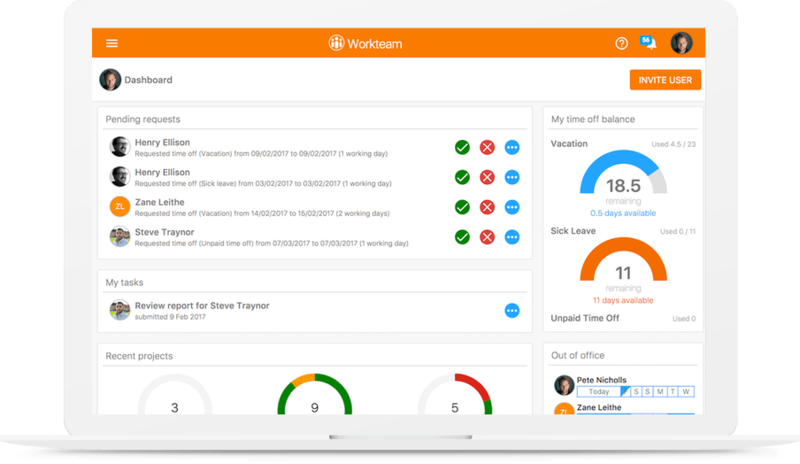 Workteam can also manage time off accrual for non-regular hours workers. Paid and free plans available. 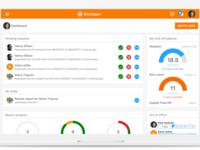 Workteam Time Off Tracker Reviews Recently Reviewed! Pros: This is software has a free function that is easy to use, does what it needs to and has great customer service. This is a software that is for the people, by the people and definately makes tracking and requestiong PTO for our staff so much easier. Cons: I wish that you could request off a specific number of hours off, instead of just half or full day. Overall: Workteam has allowed me to streamline the PTO tracking which has allowed me to spend more time on other tasks allowing me to be more efficient. It has also made it easier for all our employees because the information is all in one place. Many thanks for your review Karla. Employees can actually request time off by the hour, but for this you need to subscribe to the paid features. Pros: Workteam is great for a remote working company like Topcontent.com because you can integrate different teams from around the world on to one platform. Cons: There have been some restrictions or manual workarounds but workteam are always working to improve the system. Overall: The personal level of customer service is great. At Topcontent.com it's important to us to be able to ask questions and get answers quickly. Also, several improvements have been released since we have been using the system so it's reassuring to see that the company is investing in their system. Pros: Workteam covers basic functionalities needed for managing PTO. This is definitely much better than a spreadsheet even using the free version. We have encountered a couple of bugs along the way, but Workteam has been fantastic at responding quickly to fix them. While there may be more elegant and advanced products out there, they are expensive and difficult to manage. Workteam fits our needs as a small company perfectly. Cons: The management side of things could be more streamlined. I would like to be able to setup a weekly email to all managers sharing what PTO is happening that week. This is an easy to set up and use app. Pros: Having choices of how to view PTO balances, ability to set up different policies - and most recently added - the ability to chose colors to differentiate between types of PTO. User Guide is very helpful. Support is fantastic! Cons: Not having the choice of PTO increments. We allow as little as an hour but can't enter that so the PTO in workteam does not equal what shows on the employee check. Would like choices for different calendar views. Thanks for the review Lori. Workteam can handle requesting time off in increments as little as 5 minutes (depending upon policy configuration), but not in the free version, which you are using. Pros: It's simple. There are only ever a couple options on each page. Visual calendar layout for individual and team member's time off was nice and easy to read, digest, and remember. Free (zero cost) version fir out needs with 20 or so employees, from what I know. Quick, easy reporting on time-off requests. Every employee LOVES that. Cons: WAY too many notifications. I still get them. We left this as an hour-by-hour tracker (hourly pay employees) because the simplicity created complexity for our accounting department. Likely just differences in systems. Overtime was difficult to report accurately between paychecks. Overall: It's a simple interface that feels stripped down. It's not pretty, but honestly, I don't want a pretty time tracker or time off calendar. I want one that works - and this one does the job well. Pros: We need something that helps us manage vacation and all other sorts of time off. This does the job well and has eliminated all spreadsheets we previously had. Cons: Our workforce is a global workforce there it can be time consuming when setting up new people into the system. Also, we would like to store more information about employees but this feature is currently not there. Overall: It has reduced time and increased the efficiency when managing time off. It allows for easy reporting and an easy overview of the time off performance across the company. Pros: From my End users' point of view, they are moving away from paper application to eLeave portal application, it's on internet which allows ease of accessing the site and this allow the self-service way of checking leave balance. From Company's point of view, the value is the streamline of work process, allow Users to work more efficiently, cost is reasonable. The look and feel is similar to our current HR system - WD. Cons: I'm from APAC region, the support is from UK time zone? Cons: Nothing really. There's always room for improvement but Workteam works exactly as we need it to at the moment. Overall: I was looking for an easy way to track employee PTO. I evaluated our free option with TriNet - the UX is slightly confusing and UI is quite cumbersome. I looked at alternatives and Workteam came up. I like the simple, intuitive UI, that it's fairly full featured and flexible, and has an integration with GSuite calendars. 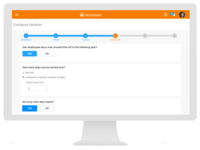 We've used the platform for several months now and as much as we can say this for HR software, has really enjoyed it =) We've also had very good experiences with and support from the Workteam team on answering questions, etc. Overall, a very good experience and would highly recommend. Overall good, just wish it could allow me to request time off differently. See cons section below. Pros: It is easy to use, and it has an appealing interface. The staff were quick to respond when I had an issue to be resolved. Cons: You can only request time off that is either a half day or a full day. If I need to use PTO for 1 hour, as an example, I can not input that into Workteam as so. This is a large pain for most staff. There was slowness in the system recently that required their support staff to release a patch. The only way to contact them was via email. No phone number. They did have a quick response time and resolution time through email and were nice to work with. Overall: Ability to input time off. Thanks for the review Justin. We have actually just released a new version of the software, which allows PTO requests down to 1 hour (and below). Pros: Simplicity to use. No need for user training. Great Support by the Workteam. The excellent view for the global calendars. Cons: It is not possible to distinguish the days of holidays marked by the company and the holidays of the country. Very Proactive Support, Sleek interface. Pros: I love the interface, very smooth navigation. Employees have loved the ease of access for checking PTO accruals and requesting PTO.